The SPI experience in Bangalore comes with picturesque cinema halls, automatic recliners and unlimited popcorn toppings. Yup, that's the Sathyam experience, if you're wondering what SPI is. SPI Cinemas is well known for offering an overall cinematic experience since its inception in Chennai with the landmark Satyam Cinemas. Bangalore has been waiting long enough to get its own version of the same experience. 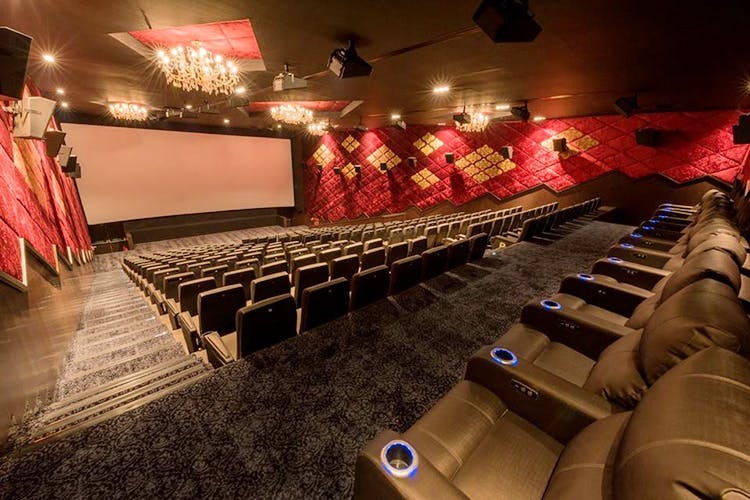 The wait was officially over when SPI Cinemas launched its first theatre, The Cinema at the GT World Mall, Magadi Road. Of course the theatre has good sound, great screen, and fancy interiors -- that almost goes without saying in the modern day. But throw in swaying chandeliers, curtains and automatic recliners, and you've got a clear winner! The recliner seats are priced only at INR 350, which at most other multiplexes is the regular seat! The normal seats at this cinema are priced between INR 115 – INR 150 on the weekdays and INR 180 – INR 210 on the weekends. So much win! But that isn't quite the best. The best is that the popcorn comes with unlimited toppings! They have three signature flavours -- Mexican Cheese, Barbecue Chilli & Cream & Onion. So if you buy a regular tub of popcorn, top it with these amazing toppings for free. You cannot deny that the whole experience of watching a film is made better by popcorn. Even if the movie is bad! Hit up the cinema on a Tuesday for the cheapest tickets at INR 115 and Thursdays to enjoy movies with subtitles.